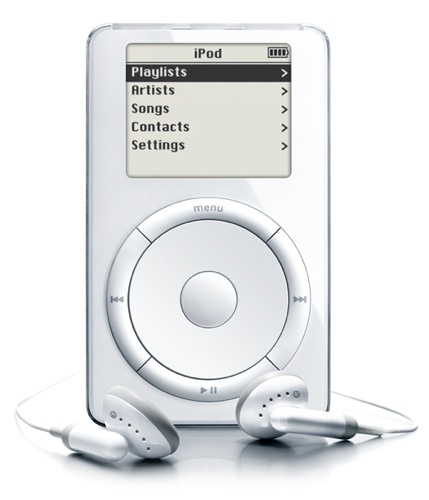 Apple's iconic iPod digital music player will be ten years old on Sunday. The first model, which contained a 4200rpm, 1.8in Toshiba 5GB hard drive for storage, was announced on Tuesday, 23 October 2001, though didn't find its way into buyers' hands for another couple of weeks or so, on 10 November. 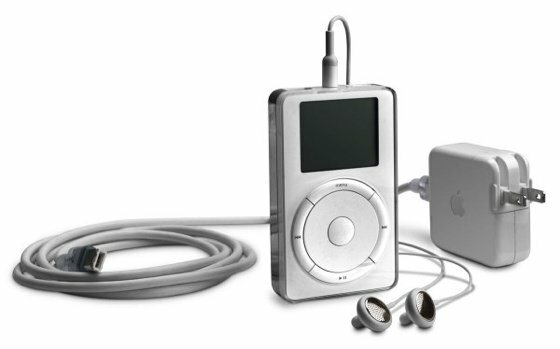 Early adopters were treated to a compact player - it was 101 x 61 x 20mm and weighed 186g - kitted out in the glossy white plastic that's now indelibly associated with Apple's music players, though the back panel was highly polished chrome-look stainless steel. Yes, the now trademark white earphones first appeared bundled with the very first iPod. So too did Apple's compact AC adaptor with a removable pin module to allow it to be connected to power sockets the world over. Above the novel rotating mechanical navwheel - really the only innovation Apple's first iPod brought to the portable music player market - was a 160 x 128 monochrome LCD showing iPod OS 1.0's side-scrolling hierarchical menu structure. It had 32MB of Ram, enough to buffer data for 20 minutes, not only to provide skip protection but also to allow the player to spin down the hard drive and conserve power. It could, Apple claimed, play music for ten hours. 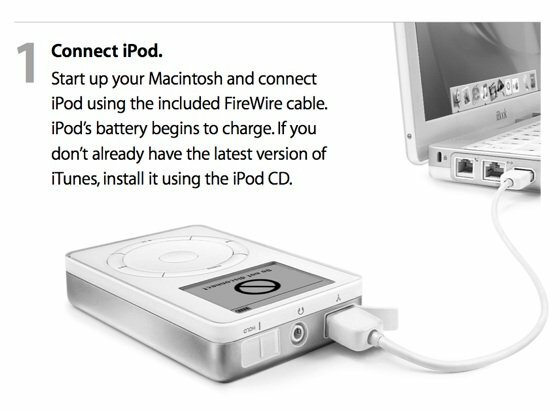 Aimed exclusively at Mac owners - and thereby limiting demand until a Windows-compatible version was launched a year-and-a-half later, in July 2002 - the first iPod, codenamed 'Dulcimer' during development, used Firewire 400 to connect to a host computer, transferring songs far more quickly than the then commonplace USB 1.1 standard allowed. USB 1.1 would have taken hours to transfer the 1000 160Kb/s songs the iPod could hold. Firewire could do it in ten minutes. The dock connector, foundation for an entire industry of iPod accessories, didn't debut until April 2003. Firewire support survived to 2007, but by 2005 had been replaced as a song transfer mechanism by USB, continuing from that time solely as a means for charging the player's battery. By then, the iPod had reached its fifth generation. The original was developed by a team put in place by Apple's then head of hardware, Jon Rubenstein, later of Palm fame. Rubenstein put engineers Tony Fadell and Michael Duhey on the case, with industrial design being handled by Jonathan Ive.